September 27, 2013  In pursuit of beauty, women around the globe subject themselves to complicated and bizarre, not to mention dangerous, procedures. In the West, that can mean going for darker skin. In Africa and parts of Asia, the opposite is the goal. Seriously, a sister just can't win. 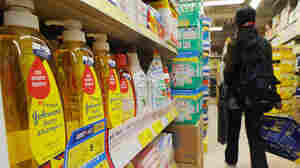 August 15, 2012  The health products giant affirmed the safety of the chemicals in question but acknowledged that hasn't been enough to satisfy some critics. The chemicals on the way out range from triclosan, an antibacterial ingredient, to others that release small amounts of formaldehyde. March 9, 2012  Some skin-lightening cosmetics contain dangerous amounts of mercury, the FDA warned consumers. Though illegal to sell in the U.S., the foreign-made products are popular in communities where fair skin is considered a mark of beauty. February 15, 2012  A consortium of consumer and environmental groups says there's too much lead in lipstick. The Food and Drug Administration says there's nothing to worry about.